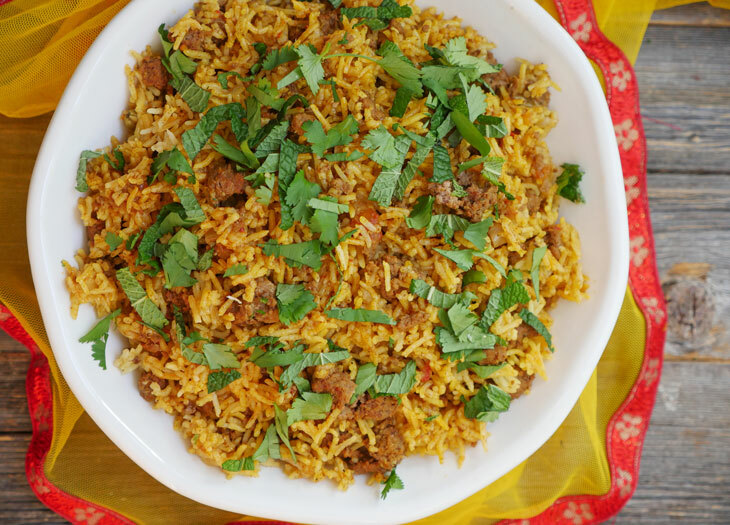 This flavorful and mouthwatering keema biryani, a spiced ground meat and rice dish, is about to become your new favorite meal! 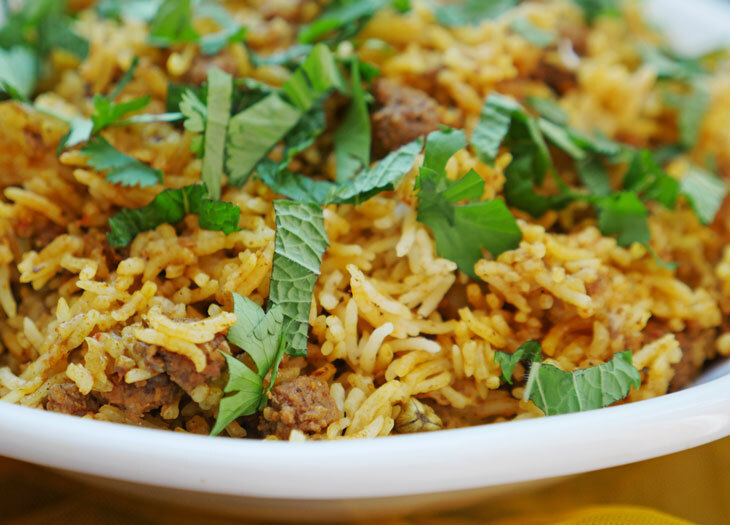 Keema biryani or keema pulao is a one-pot dish made up of spiced ground meat, long-grain basmati rice and aromatic spices. It’s a weeknight favorite at our house as well as a dish we serve when we have company. It’s so easy to make and impressive too! If you have my cookbook then this recipe might look familiar to you. In my book, I called this dish keema pulao. The word keema means ground meat (have you tried my instant pot keema yet?!) and pulao or pilaf is just rice cooked with spices. I decided to change the name of this dish to keema biryani here on the blog because apparently there are more people who search for “keema biryani” than “keema pulao.” These are things that food bloggers have to think about… This dish is very flavorful so I suppose it really is more like biryani since pulaos are typically a bit more subtle in flavor. You can call this keema biryani or keema pulao or keema rice or ground meat pualo. Or just call this “that scrumptious rice dish from myheartbeets” 😉 Whatever you call it, know that it’s absolutely delicious. 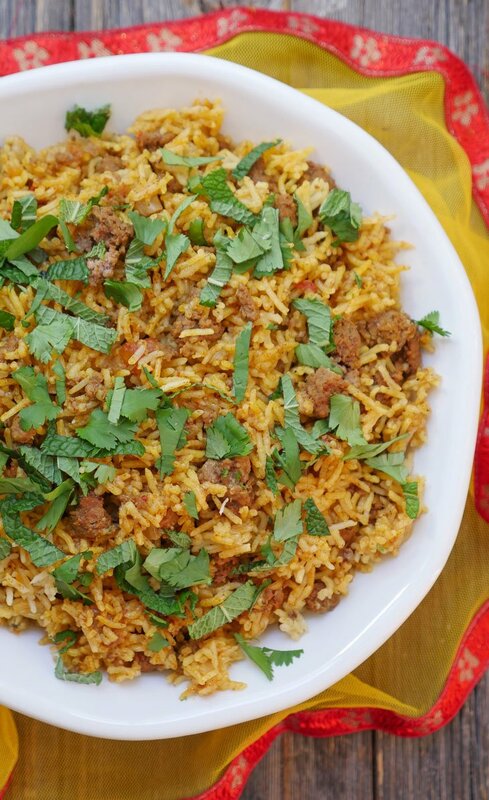 If I’m making this keema biryani on a weeknight, I’ll sometimes leave out the herbs (I usually have cilantro in the house, but I don’t always have mint). If you’re serving this on a special occasion though then be sure to add the herbs. They add a bright fresh flavor to the dish. My goal for the spring/summer is to grow my own cilantro, mint and parsley so hopefully I’ll always have fresh herbs nearby. I have a brown thumb (both literally and figuratively) so I’m hoping I don’t kill my new plants right away. It makes me so happy to see pretty green herbs every day. If you’ve tried my chicken biryani or my shrimp biryani or my lamb/beef biryani then you know I know good biryani. Biryani has been one of my favorite things to eat for as long as I can remember so I know what good biryani should taste like. This keema biryani is so dang good. You are going to love it! I can’t wait to hear what you think of this dish! If you love it, then be sure to check out my Instant Pot Cookbook: Indian Food Under Pressure for more Indian recipes! This one-pot dish of spiced beef and rice is both a weeknight favorite at our house and a dish we serve when we have company. It’s flavorful and really quick to make. I’ll sometimes leave out the chopped cilantro and mint, but if you want it to taste extra special then don’t forget to add the herbs. Press the sauté button, then add the oil to the pot. Allow the oil a minute to heat up, then add the whole spices to the pot and give them a stir. Once the spices begin to sizzle, add the ground meat, onions, garlic, ginger, Serrano pepper and cook until the meat is mostly browned. Add the ground spices, mix well, then add the tomatoes and cook for 5-6 minutes, or until they have softened. Dump the rice on top of the meat (do not mix) then pour water on top. Sprinkle half the cilantro and mint on top of the rice. Remove whole spices and sprinkle with remaining cilantro and mint. ummm just wow! I made this last night for me and my fiancé (who absolutely LOVES biryani) and we were both pretty much speechless. It was DELICIOUS! It tastes like it took hours to make the way the flavors all come together. I also made your Instant Pot Saag (half the recipe quantity) and added paneer to it at the end. What a meal! We have so many leftovers and we can’t wait to eat it again tonight. Ashley! I’ve tried a few of your recipes and I just love them all! Thank you! Don’t worry, it’ll turn out well! Any type of tomato will work – I usually just use whatever is available at the grocery store 🙂 You can look for medium sized tomatoes. Hope that helps! Where would you recommend I get whole spices? I can double check my local grocery store, but I have a hunch they won’t have all of what I’d need. We do have local Asian markets that are a little bit of a drive from me..would that be a good place to look? Also, for the 2 tomatoes – would canned diced tomatoes work as well for this recipe? Thanks so much!! I am on a “Staycation” for a couple of weeks here and I really want to do some more cooking, your website is the first place I go for new things to try! Do you think it’ll taste just as good the next day? I wanted to prepare the night before for guest coming over for dinner the next day. Hi. Can you use brown rice and how long do I cook it for? I made this on Friday night, SO GOOD! My first Indian dish, and my whole family loved it. Will be a regular recipe in our house. ♥️ Thanks Ashley! REALLY good. Kind of tastes like a kofta kebab. Was nice with a bit of greek yogurt. One issue is that the my instant pot duo 6 qt couldn’t quite get up to pressure due to the low amount of water. Since it’s just steaming the rice I let it sit at whatever pressure it got to for 15 minutes before releasing the steam and it turned out fine. But you may want to adjust the recipe. Charles, glad you liked this biryani! As for the pot not reaching pressure – just to confirm, you used the same cup to measure both the rice and the water, correct? This was delicious. My 85 year old grandmother who has never really eaten Indian food AND my fuss-pot toddler both loved it too. And so easy! Very enjoyable! I made the biryani with brown basmati, canned tomatoes and only cilantro, though I’d like to try it with the mint also next new. After i released the remaining pressure, i stirred in a couple cups of frozen green peas and let it hang out for a few mire minutes – lovely 🙂 thanks Ashley! That’s great to hear, Carey! I’m so glad you liked it 🙂 Love that you added frozen peas too! I make a lot of Pakistani/Indian food but am admittedly lazy about it. 90% of my recipes use boxed spice mixes, yesterday I was searching for a new recipe to try out and came across this. My initial reaction was nope, I’m not even sure I have actual individual spices but as I read on I figured I’d give the recipe a try. Not only was it easy (thanks to my mom’s recent visit I found all but one of the spices in my cabinet) it tastes AMAZING. Both my kids, my hubby and I all loved it! Now I’m even contemplating cooking over the weekend (unheard of!) just so I can try out another recipe. Thanks so much! Haha thank you!! I’m so glad you made it and tried it 🙂 I can’t wait to hear what you think of any other recipes you try from my blog! This looks so good! I just recently purchased an instant pot and was searching for desi recipes, so glad to run across your blog and see so many instant pot recipes!!! As a newlywed and new chef, it makes cooking for the in-laws less daunting 😄 Wondering if I can substitute the minced ginger and garlic w ginger and garlic paste, and if so, how much of each? Also, are fried onions ok to use in these recipes or should it be fresh? Can’t wait to try this recipe! Amazing! Loved this recipe and am looking forward to trying more of your offerings. I live in a tiny town, and ground cardamom and ground cloves were what I had to settle for. Wondering about the whole cloves…after cooking, would they need to be avoided like the cinnamon stick and bay leaves or would they be softened? Hi Nida, so sorry for the late reply! You can double the ingredients but leave the cook time the same – it’ll just take longer to reach pressure 🙂 I haven’t tried tripling the recipe but I think it’d be the same – to leave the cook time the same. I hope your guests loved it! Excellent share ,really enjoyed the biryani.Your recipes are amazing.My husband really enjoyed it. I made this for the first time this week, subbing in 15 oz diced tomatoes and cutting the onion down to just a few tablespoons, and it was fantastic. One request: My husband has asked me to try a chicken biryani next, but that page is broken. It loads, but you can’t scroll down and read it. I’ve tried in different browsers, with no luck. Sorry if I missed this answer elsewhere, but do you measure the rice by the measuring cup, or by the instant pot/rice cooker cup? Thank you! I made this tonight—so yummy! I’m sorry if I am posting again (computer snafu) or if I missed this answer elsewhere. When you measure the rice, are you using a measuring cup, or the instant pot/rice cooker measuring cup (since the “cups” aren’t equivalent). Hi, love your recipes so much! I was wondering if you think ground turkey would taste good in this recipe? Thanks! Hi Ashley, for chicken biryani recipe how many cups of rice can be used in 6 qt instant pot. I want to make it for a party. I want to make biryani for 10-12 people. Do you have a cauliflower rice biryani or Pulao? I made the kheema biryani with Soya chunks instead. And it turned out so awesome. Best biryani I have ever made. Thanks a ton! Aishwarya, I’m so happy to hear that! Thank you for letting me know how it turned out for you! Just made this for dinner and it was so YUM!! my kids loved it 🙂 Thanks a lot Ashley. As you know chicken keema cooks real quick. And by following the recipe above, the chicken keema will surely be overcooked. Any recommendations on how best I can make this dish without making the chicken keema dry? Wow Ashley, what a recipe!!!! I made this for my family as part of my experiment with my new Instant Pot, and we were all blown away. This is going to be a regular meal at our house, as my kids have already asked me to make it next week again. Can’t wait to try out your other recipes! I don’t see any information about how many the recipes serve unless I am missing it. I am planning a menu for 14 and need to know. Thank you. I added a few extra spices but followed all the other instructions exactly and it turned out so well! Thank you! Happy to hear that you liked it! I made this today not using the IP or rice. I substituted riced cauliflower and 1 cup of cooked quinoa. Super good, or as good as something can be without using real rice! Thank you for your always wonderful spice combintaations. I tried to make this and followed the recipe but my rice came out totally uncooked! So I have added another 2 cups water and put it back on. Hope it works! Any ideas what could have gone wrong? that doesn’t sound right – was the pot sealed properly? are you using basmati rice? Ashley, I can’t thank you enough for such wonderful and easy recipes. Will try this keema biriyani today. How many tomatoes and what size please? It’s not listed under ingredients. Hi! Can I use my frozen Onion Masala for this recipe too? I have so much of it from making it and freezing it from your recipe, and i’d like to try a few new things. If so, I assume hold the onions, garlic, ginger and tomatoes, but where would i add the frozen pucks? Made it with minced chicken today. Turned out really good! Thank you!! Omg the best meal I have ever made. Great recipe!!!! Tried this for Sunday lunch and came out sooo goood.